I have a personal stake in what is being planned right now as the future of the basic education program here in the Philippines. This is so not just because I view basic education as a critically important ingredient in making people's lives better, which I do. But more importantly for me, my young daughter and son will be directly affected by what the government will ultimately decide on as the right approach to basic education. 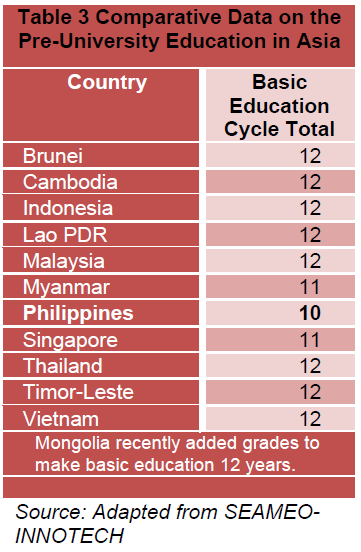 Fortunately, the new administration of President Noynoy Aquino is giving basic education the attention and budget it deserves. There has been much talk lately about the new proposed program called K+12. This program basically copies what other countries have done and what has been the internationally accepted standard basic education. That is to make basic education longer than the 10 years it was by adding two more years to make it twelve. For all its good intentions, K+12 is being opposed by some who think that this is an added burden to our already growing problem in primary and secondary education. Reports of insufficient funds, dilapidated classrooms, overcrowded classes, underperforming students, etc. are well-documented. As it is now, there are many challenges facing the Department of Education. Adding two more years of secondary education which will require more resources in terms of classrooms, chairs, teachers and many others seem contrary to common sense. But the country is falling behind. International tests results demonstrate our inability to effectively educate the young on the basics of science and mathematics. This has a direct impact to our ability to compete in the global market to grow our economy to become more prosperous. And the way to catch up is to prepare the future generations to be better equipped to meet the challenges of things to come. It is not known to everyone that we are the only country in Asia that still has the 10-year basic education program. This puts our graduates at a disadvantage in the world market because not all countries recognize them as professionals. Most countries prescribe a 12-year basic education for university admission and practice of a profession. Indeed this will be a really difficult project to implement. One that would require much political courage and wisdom. Our leaders in this field is well-aware of these challenges and should have been doing their homework to make this successful. One area that needs focus is the financial viability of moving to this new setup. The government of President Aquino is currently doing the studies which will determine the amount of money needed for K+12. In the meantime, my daughter has already started the K (Kindergarten) of K+12 now that she is 4 years old. She should be finished with Kindergarten ready to move to elementary by the time she turns six. She would spend 2 years in Kindergarten, 6 years in elementary, 4 years in junior high school and 2 years in senior high school for her basic education. This will be 14 years total. It is my hope that this will make her better equipped to enter college to pursue whatever profession she wants for herself. This is what every student deserves and we should, as a society, aim for it.